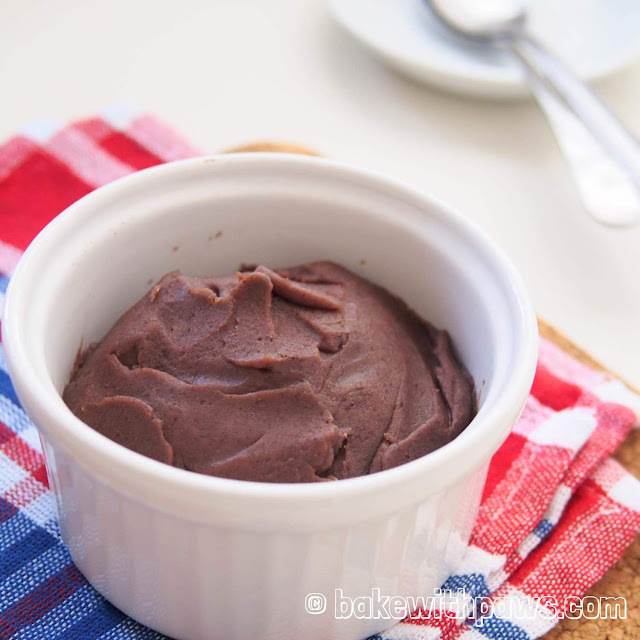 Here's a easy homemade red bean paste recipe for Green Tea Buns or Tau Sar Pau. I used very minimal sugar and you may add more if you like sweet. If you like the runny type red bean paste, please add more oil. Wash the red beans and soak the dried red beans at least 8 hours or overnight. The longer you soak will reduce the cooking time. Put the soak red beans in a pot with enouch water, and bring to a boil over high heat. Then turn the heat down to low and simmer for around 30 to 40 minutes till the red beans becomes soft. During cooking, if the water level drops, add boiling water so that the beans are not dried. Remove pot from heat and let it cool down. Once cool down, transfer the red beans to the food processor. Blend until smooth and very fine. Transfer the red beans paste to a pan. Then add sugar, salt and butter in. Simmer over low heat to melt the sugar and remove exceeded water out. During the process, keep stirring the paste. Turn the heat off when it reaches your desired consistency. When the pastes cool down, store in airtight container in the refrigerator for up to two weeks.